So, um, it was kind of a rough week for the Egyptian Museum, eh? 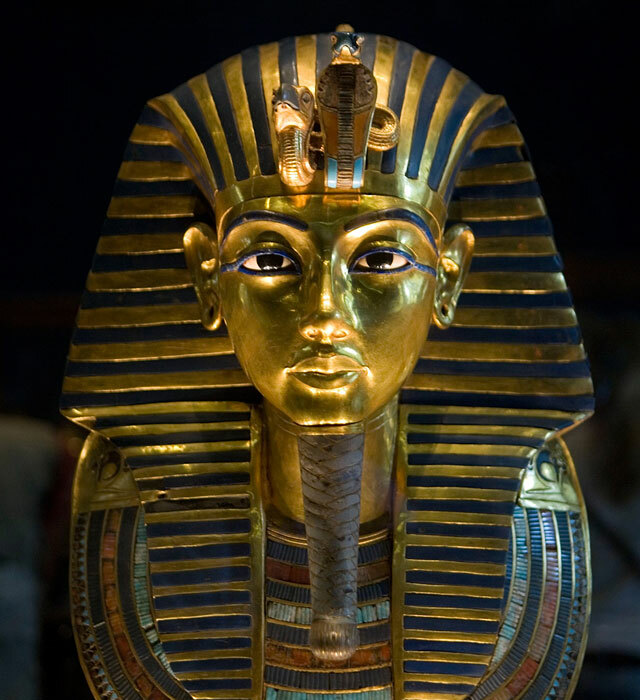 Several news outlets reported that King Tutankhamun’s burial mask, arguably the most famous archeological item in the world and certainly the pride and joy of the Egyptian Museum, had its beard taken off last year, either because it was damaged during a cleaning (the popular suspicion) or because it was already falling off and needed to be restored (the museum’s official story). OK, so Tut’s beard got broke. It’s a shame, but stuff happens, right? This kind of thing is exactly why museums pay people to care for and restore artifacts, right? Well, yeah, except unfortunately the effort to repair the damage in this case went terribly wrong. Either out of haste to get the mask back into the exhibit (the popular suspicion) or plain old incompetence (which, I guess, is the museum’s official story), the beard was glued back on to the mask with epoxy, and the job was done so carelessly that there’s now a thin but clearly visible crack, filled with opaque yellow dried epoxy, separating the beard from Tut’s chin. Oops. 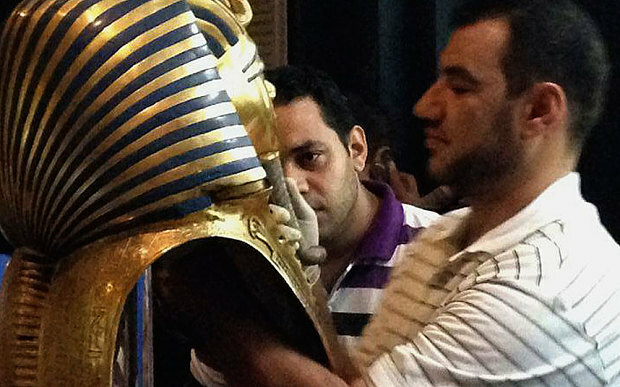 The director of the museum, Mahmoud Halwagy, is insisting that whatever happened to the mask happened before he got the job in October (AKA the “it was like that when I got here” defense), but a group of Egyptologists called the “Egypt’s Heritage Task Force” are planning to bring evidence to prosecutors to see if charges can be levied at the responsible parties. The problem is that epoxy is incredibly strong stuff, and not only is it inappropriate to use on a piece like this in general, but if you get the job wrong it becomes very difficult to separate the pieces and try again. 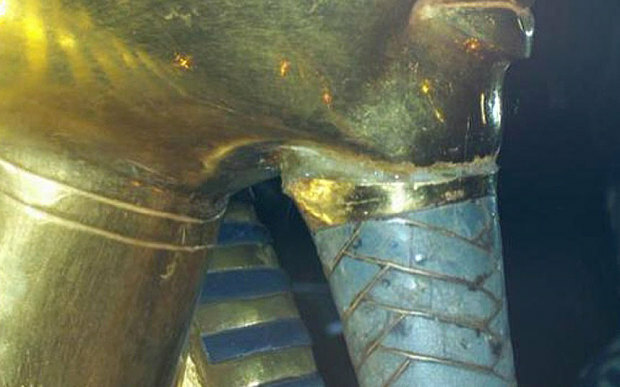 Egyptian authorities hurriedly flew in a German restoration expert today to take a look at the botched repair job, and he declared that it would be possible to remove the glue and properly restore the piece, but we’ll see. This is a big deal for Egypt not just because of the real value of this particular piece, but for the symbolic importance attached to Egyptian artifacts in general. For one thing, Egypt depends a great deal on tourism, and after three years of revolution, counter-revolution, violent suppression of protests caused by said counter-revolution, increasing terrorist activity in the Sinai, and general regional instability, Egypt is still struggling to get its tourist numbers back to where they were a few years ago. 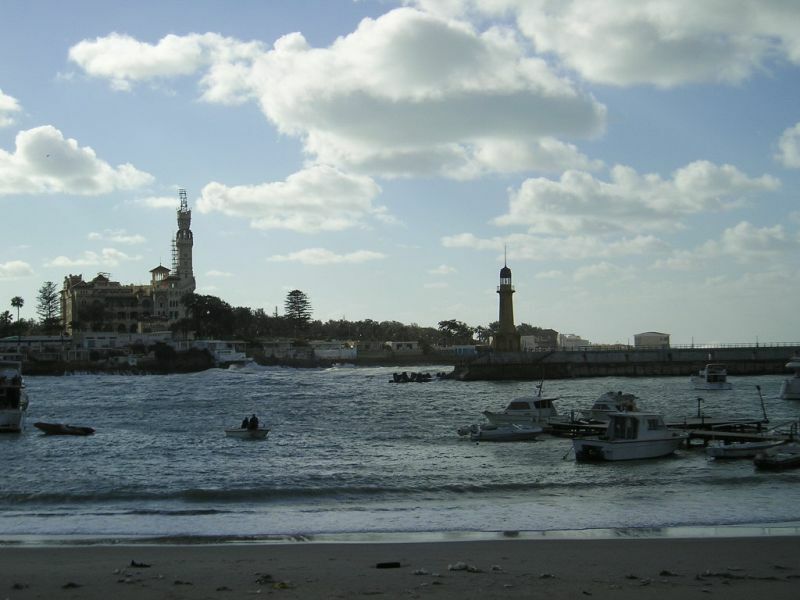 A story like this is the last thing the Egyptian tourism industry needed. 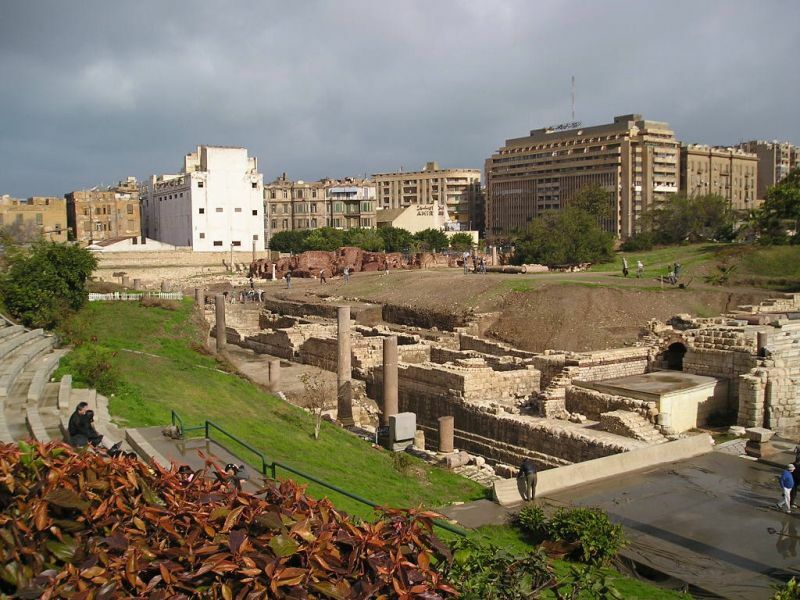 For another thing, one of the battles that Egypt’s antiquities officials are constantly waging is the effort to get foreign museums to repatriate important artifacts that were plundered from the country during its colonial period. The Egyptians want desperately for the British Museum, for example, to return the Rosetta Stone to Egypt, or for the Louvre to return any of several important Egyptian pieces that it houses. The chief argument those museums make when refusing to return the artifacts, the one argument they can make that doesn’t smack completely of colonial appropriation of another nation’s cultural heritage, is that the Egyptians can’t take care of what they already have, let alone these other pieces. It’s a low blow, but it’s not wrong either; anybody who’s ever visited the Egyptian Museum can attest to cases upon cases where stuff has basically just been tossed in for display without much concern for how it’s organized or what kind of care it’s getting. The case against repatriation on those grounds got stronger in 2011, when rioters used the Tahrir Square uprising to loot and destroy several artifacts in the Egyptian Museum, and in 2013, when the Malawi Museum in Minya was almost totally looted during the violence that followed the ouster of former President Mohammad Morsi (most of the artifacts have since been recovered, but the fact that it happened at all is the problem). A story like this is just going to add more weight to the argument that Egypt can’t be trusted with her own history. 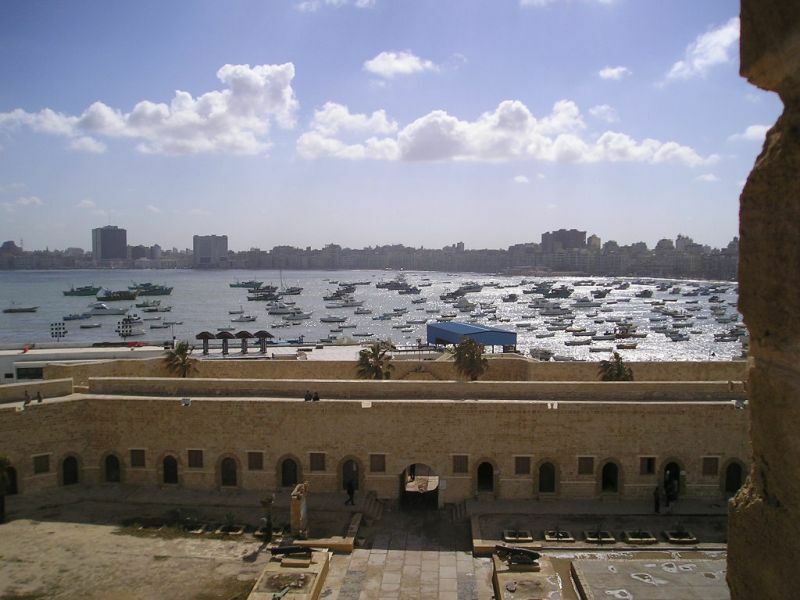 Alexandria (the one in Egypt, to be specific) was one of the greatest cities in the ancient world, but shrunk in both size and prestige after the Arab conquest of Egypt, when the Egyptian capital was moved first to Fustat and then to Cairo (which today has grown so large as to have swallowed the remains of nearby Fustat). It was rebuilt starting in the 19th century and today is one of the 50 or 100 largest cities in the world, depending on how you measure urban population. It was the first stop on my trip to Egypt, after flying into Cairo during a sandstorm and then driving all night to get to a drafty apartment in a cool, rainy city. It was January, but I was packed for Cairo and Luxor weather, so I was totally unprepared for the Alexandrian weather and had to go buy a jacket the next day, and to get a room at a decent hotel where the wind wasn’t blowing in every night. Alexandria is incredibly unique, a Greco-Roman outpost in the middle of a country that is otherwise Arab or Pharaonic, but the Greco-Romanness of the ancient city was definitely affected by Egyptian culture. 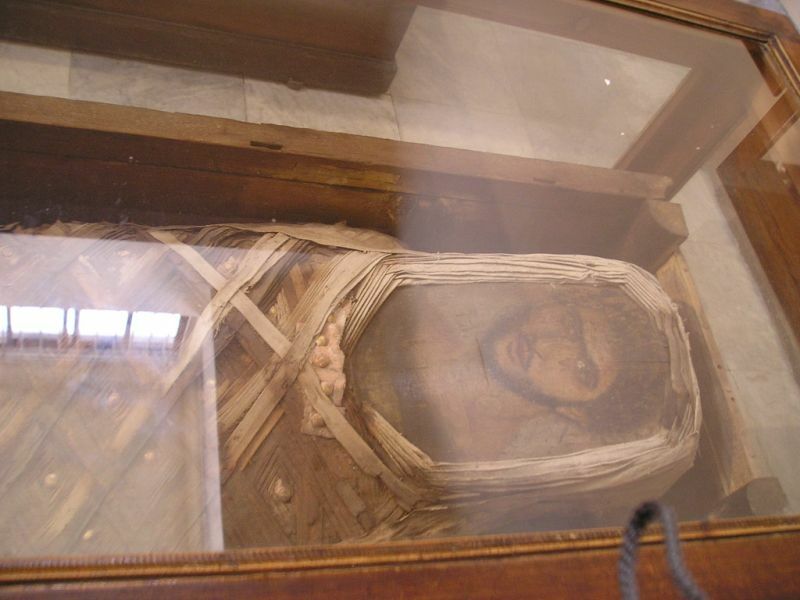 I don’t mind saying that the first mummy I saw in the Alexandrian museum, wrapped up like a mummy should be but with a painted Greek face on it where the carved Egyptian funerary mask should’ve been, weirded me out a little bit. 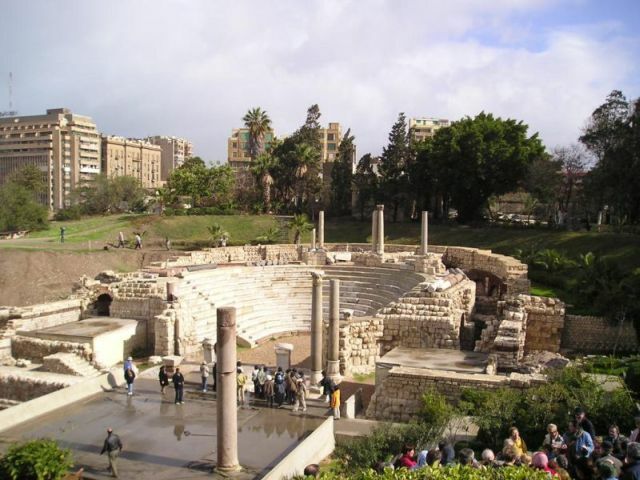 More of the amphitheater complex; one of the things I like about Egypt are the scenes of ancient and medieval sites existing within a totally modern, urban space. 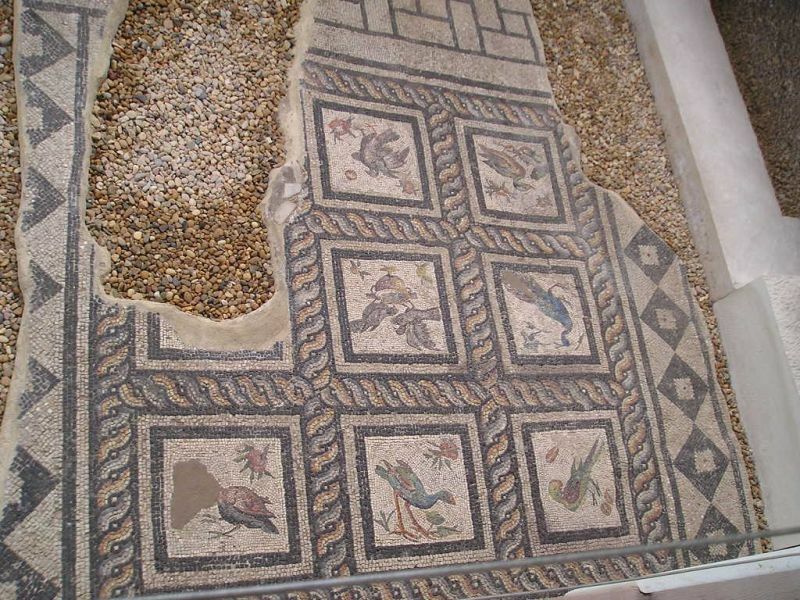 Villa of the Birds, yes? A trip through the city’s catacombs followed, which was awesome but for which I’ve basically got zilch in the way of decent pictures. Digital camera tech was considerably more primitive back then. 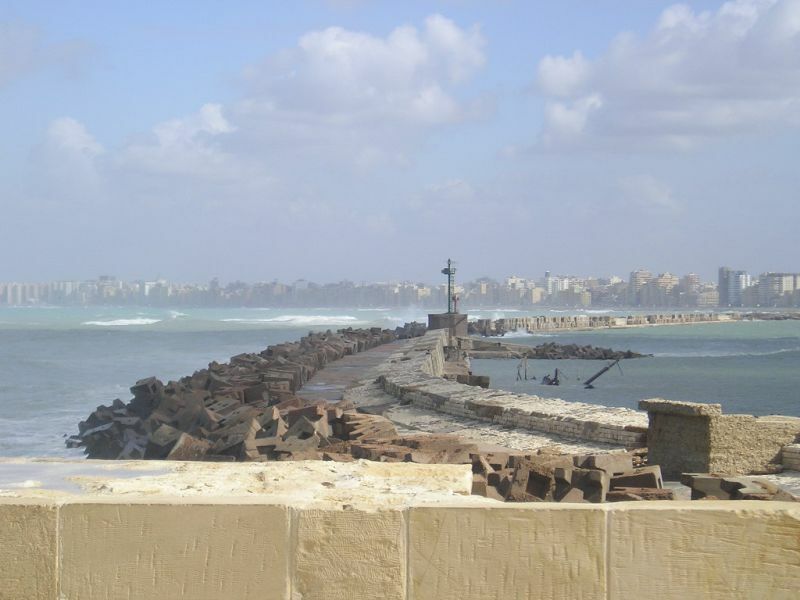 Later I headed to the harbor, the geographic feature that made and still makes Alexandria such an important city. 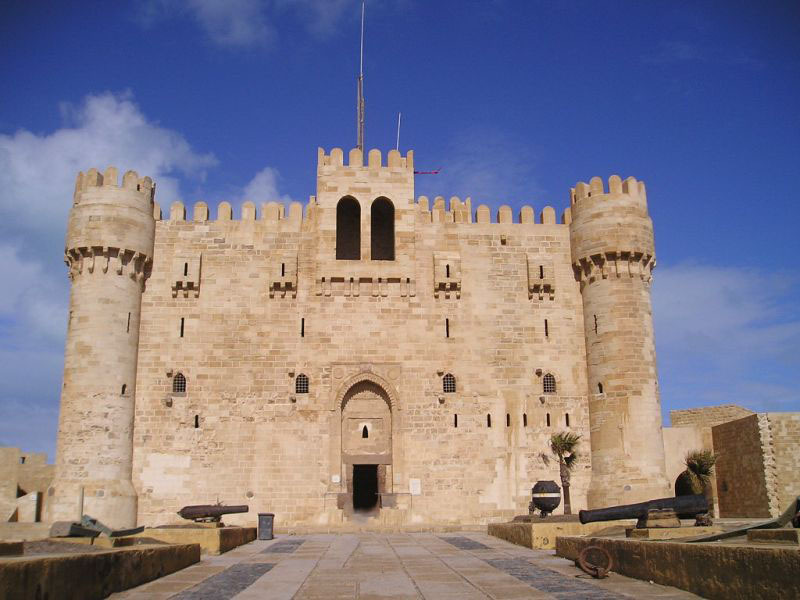 In ancient times the shore of the harbor was dominated by the great Lighthouse of Alexandria, but a series of earthquakes brought her down, and in 1477 the ruins were used by the Mamluk Sultan Qaitbay to construct a massive fortress, the Citadel of Qaitbay, to defend the harbor. View of the harbor from the top of the fort. View of the harbor entrance. 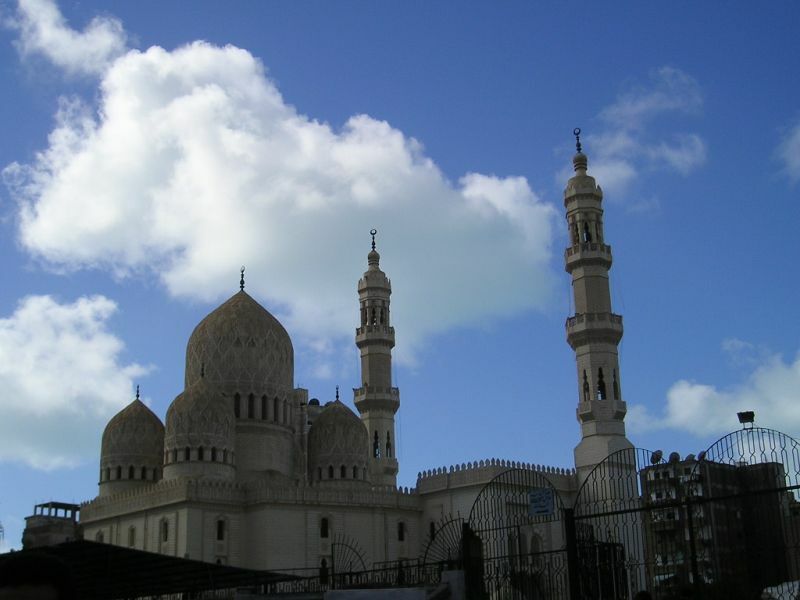 Near the Citadel is the Mosque of Abu al-Abbas al-Mursi, a famous 13th century Sufi whose remains are said to be interred there. 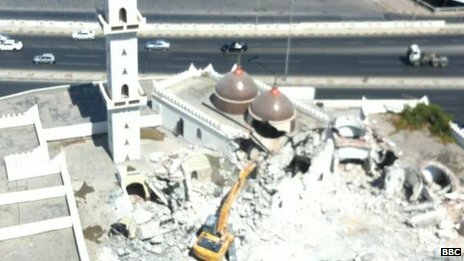 For reasons that escape me now, all these years later, I didn’t get particularly close to this mosque and just took a photo of the minarets and domes at some distance. 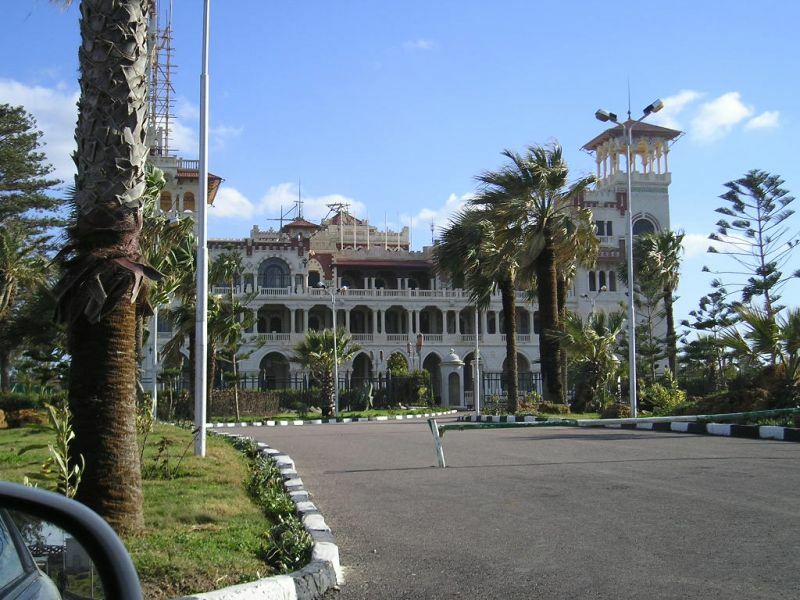 The last stop in Alexandria was the Montaza Palace and Park, built and expanded in the early 20 century by the khedives (who later styled themselves “kings”) as a summer palace and hunting lodge. 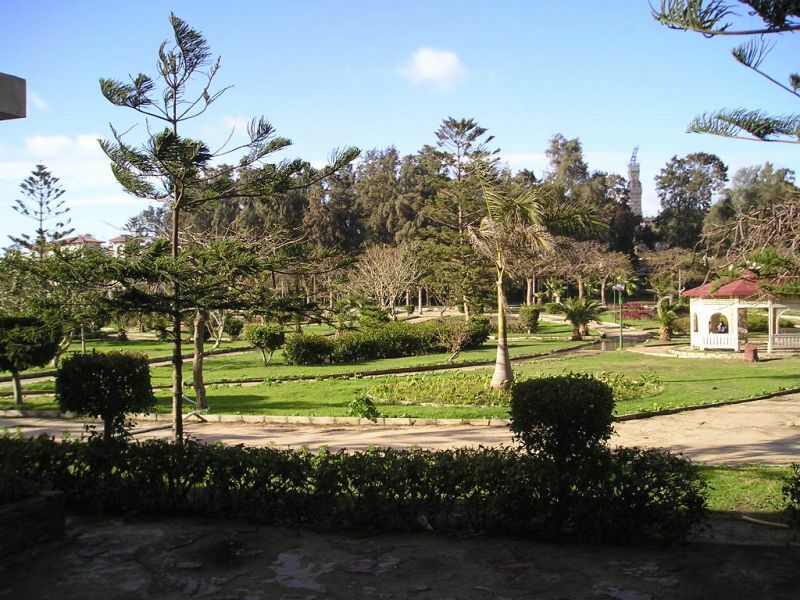 It’s situated on a bay, and the whole combination of bay, gardens, and palace is very striking.